Access REPORTS are a way of displaying and printing information from your database. Developers often use Reports to display the results of a Query, which is what we are going to do next. Like other Access database objects, there a number of ways to create an Access REPORT. We are going use the REPORT WIZARD. Our task is to display the results of QUERY1 which we created in the previous tutorial lesson. Begin by selecting the CREATE TAB on the Access Ribbon. 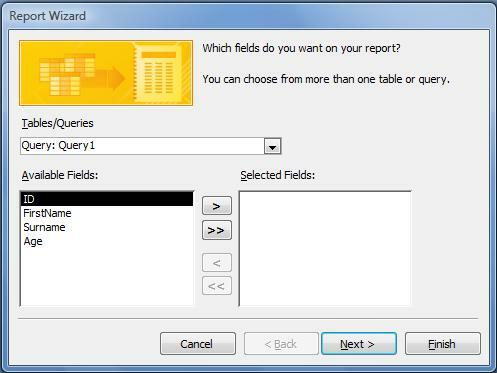 Then click REPORT WIZARD from the REPORTS group to open the pop up window. 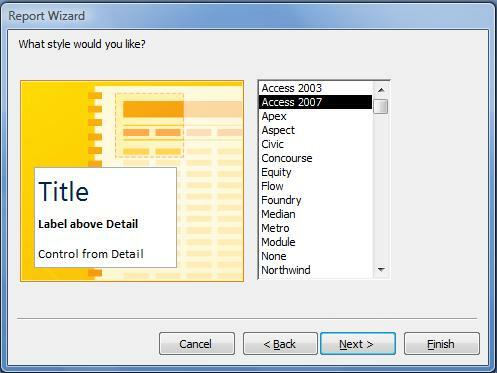 The first page of the Report Wizard is almost identical to that of the Form Wizard. On this page we will select QUERY1 as the DATA SOURCE for the Report. This is done by selecting the query from the list in the TABLES/QUERIES combo box. Then select all fields from QUERY1 by clicking the double arrow to the right of the text box labelled AVAILABLE FIELDS. The field names will now appear in the SELECTED FIELDS text box on the right. Click next to go to the second page of the wizard. Page two of the wizard is where you can add grouping levels if required. So we could, for example, group each person in our report with others of the same age. We dont need to do this for this particular example, but it is certainly a useful feature that we might want to learn more about later. But for now, just click next. Page three of the wizard is where you determine what order the records are displayed in your report. So for example you might want to display records in ascending order of age. 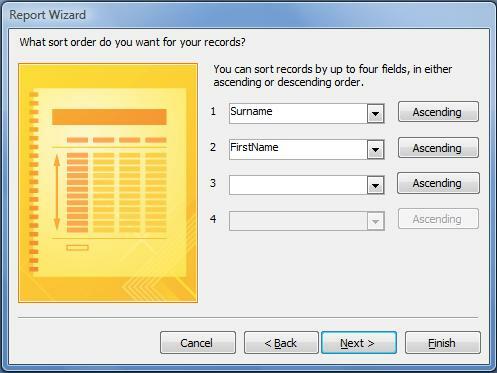 For this example, however, we are going to put your records into alphabetical order for SURNAME and FIRSTNAME. Begin by clicking the top drop down box and selecting SURNAME, and in the box 2 below select FIRSTNAME. This means that records are sorted alphabetically by surname, and if two surnames are the same, the FIRSTNAME is used to determine which record comes first etc. This page of the Wizard is where you set the lay out for your report. There are various lay out options, but in our case we shall keep to the default setting of TABULAR. For style, select Access 2007 from the list and click next. Name your report REPORT1 and then click FINISH. This is the end of the tutorial. I hope this has given you a basic foundation in Access Development Skills. If you would like to take your study of Access 2007 further, please check out my Advanced Access 2007 Tutorials and Access Tips Blog. If you have any queries about my Access 2007 Tutorial, or my work as an Access Developer, please contact me - justin@dealing-with-data.co.uk - or catch up with me on the Access 2007 Tutorial Facebook Page. I will do my best to help. Thank you.